Mayor Martin J. Walsh told the group of about 60 young people that their past mistakes do not define their potential. They had come from neighborhoods far and near, overcoming hardships both systemic and self-inflicted. Jamal Molina, 20, said he skipped so much of high school that he will soon begin his third extra school year. Sterling Goss-Davis, 19, did not have the technical skills to get a job, he said. Thomas Barbuto, 18, said he was arrested for robbery as a juvenile. 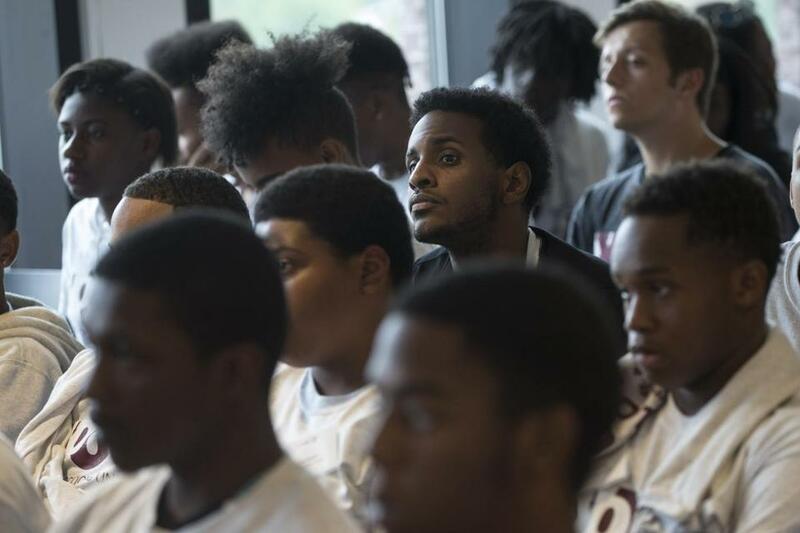 Yet Wednesday afternoon, during the completion ceremony for one of Boston’s summer employment programs targeting at-risk youth, none of these past struggles mattered — at least for the moment. Boston Mayor Martin J. Walsh, Boston Police Superintendent William Gross, and other civic and private sector leaders gathered at the Bruce Bolling Municipal Building in Roxbury to celebrate the youths’ recent successes. Walsh’s impassioned speech leaned heavily on his personal history as a former college dropout and alcoholic. His principal message to the group of about 60 young people — most of whom had experienced court troubles or were identified by officials as gang members — was that their past mistakes do not define their potential. “I felt like I could relate to [Walsh],” said Barbuto, the teenager. “He came from our level and lifestyle to being one of the top people” in the city. Other speakers pressed on similar themes as Walsh, though few spoke with rivaled fervor. Freddie Velez, the assistant deputy director for Youth Options Unlimited Boston, the nonprofit that organized the summer program, praised the young men and women for their summer of dedicated labor. According to Velez and YOU Boston, participants in the summer program completed thousands of hours of tasks, including demolition and remodeling work through the Boston Redevelopment Authority, mentoring students in Boston Public Schools, preparing meals for needy locals, and agricultural help through a horticultural society. YOU Boston’s summer program, which is in its 15th year and works with 14- to 24-year-olds, also assigns an individualized case manager for each of its participants and works with employers to secure permanent employment after the summer for those not in school. The program worked with more than 100 young people this summer, officials said. “You hear about the negative things that young people are doing like shootings and arrests, but all of you here made a conscious decision to say, ‘That’s not who we are,’ ” Velez said. “We can’t arrest away problems; we need supportive programs just like this,” Gross said. His supporting evidence was seated a few feet away. Barbuto, once arrested for robbery, said the summer program has taught him “it feels better to work for something rather than take it.” Molina, who admitted he spent many of his high school days wasting away, is now reinvigorated to secure his diploma, he said. Devin Edwards, a 22-year-old intern with the mayor’s office of Health and Human Services, got that opportunity through YOU Boston years ago. After dropping out of high school, encountering legal problems, and working a slew of minimum wage jobs, Edwards connected with Velez and completed a professional boot camp. In his current role at City Hall, Edwards works closely with Health and Human Services Secretary Felix Arroyo and helps schedule his day. At the Wednesday ceremony, outfitted in a suit and tie, Edwards served as the keynote speaker. “My advice to you is that anything is achievable. In any mistake there is a choice, and you can choose to better that mistake,” he said to his crowd of peers. Seated in the back was his 9-year-old brother, Atticus, who later called Edwards a “role model.” Also seated: Edwards’s mother, Mildred Plaza, who said seeing her son speak brought tears to her eyes. “I would not have expected this when he was 18,” Plaza said, flashing the smile of a proud parent.